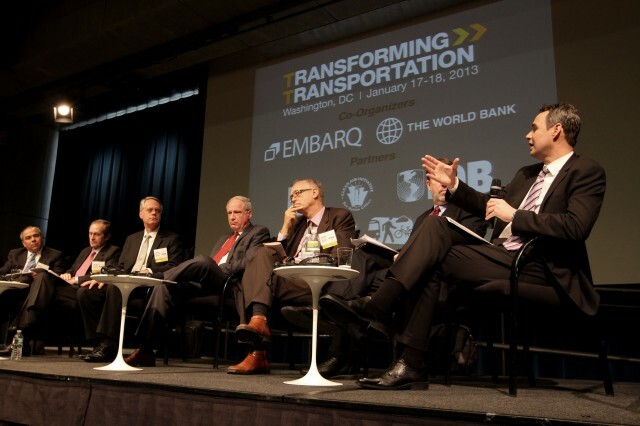 Transforming Transportation 2013 hosted policymakers and transport experts. Photo by Aaron Minnick/EMBARQ. This post was initially published on National Geographic City Solutions’ blog. City leaders face incredible pressure to deliver sustainable transportation. Cities now account for more than half of the world’s population—by 2050, they will hold 75 percent of us. These people – increasingly from the middle class – will need ways to commute to work, travel, and carry out their livelihoods. At the same time, 1.27 million people die from traffic accidents every year—about half of these fatalities occur in cities. Cities also account for about 70 percent of global greenhouse gas emissions, much of which is transportation-related. Cities, then, are tasked with a huge challenge: provide reliable, safe, and affordable transportation systems that can benefit both people and planet. Meeting this challenge is a topic we discussed at length during the 10th annual Transforming Transportation conference in Washington, D.C. The two-day event looked at the various ways to scale up sustainable transportation and share lessons learned. Examples of city leadership were featured prominently throughout the event—and can serve as inspiration for how urban centers can meet transportation challenges. Examples of cities taking the lead on sustainable transport are numerous. Beijing has built the longest metro in the world, moving 5.97 million people every single day. In China, Wuhan and Huanghzou have built the two largest bike-sharing programs in the world, surpassing Paris’s Vélib, with 90,000 and 60,600 bikes respectively. In Turkey, Istanbul pedestrianized 256 streets in its Historic Peninsula between 2010 and 2012. And we are now seeing 147 cities with bus rapid transit (BRT) and bus corridors around the globe, moving 25 million passengers every day. Some cities are even being recognized as global leaders in sustainable transport. Last week, Mexico City’s former mayor, Marcelo Ebrard, received the Sustainable Transport Award, and Eduardo Paes, received the honorable mention as Rio de Janeiro’s mayor. With assistance from EMBARQ, Mexico City implemented a BRT system to deal with the city’s mass congestion and high number of traffic-related deaths. Despite progress in cities across the globe, every day, investment decisions are still being made at the international, national, local, and individual levels that threaten to lock new and existing cities into unsustainable transportation patterns. Because driving a car is what most policymakers experience on a daily basis, building more roads or wider roads is oftentimes considered a transport solution. Examples of sprawl and congestion are numerous in the developed world. This “business as usual” approach comes at a high cost—for people, economies, and the planet. Sustainable transportation decisions must be scaled up and expanded so that cities don’t get locked into infrastructure that pollutes, generates economic loss, limits opportunities, and endangers lives. An example of sustainable vs. unsustainable transport can be seen when you compare Beijing and Shanghai. Both cities have 20 million inhabitants. But while Shanghai decided early to invest in public transport and to limit the number of cars allowed in the city, Beijing did not. Beijing now has 76 percent more cars on its streets than Shanghai, amounting to a whopping 5.3 million vehicles. This heavy car load creates congestion, air pollution, endangers pedestrians and drivers, and generally diminishes quality of life in the city. Recognizing how unsustainable its transport system is, Beijing is now investing heavily in mass transit and taking action to limit its car sales – a major step forward in a country that ranks as the largest market for automobiles in the world. We cannot repeat this mistake on a global scale as existing and future cities consider their transportation options. Many cities around the world have already made great progress on embracing sustainable transportation. It’s important that these cities continue to move forward, and that decision makers at the local, state, national, and international levels empower other urban centers to make the right choices. The C40 Cities Climate Leadership Group, a coalition of leaders from megacities around the world that aim to reduce greenhouse gas emissions, is one initiative making great gains. EMBARQ recently partnered with C40 to further their mutual goals of combating climate change by scaling up sustainable transit systems.